When general clean-up fails to keep your countertop shipshape, consider these material-specific solutions. Butcher block surfaces should be rubbed with tung, linseed, or mineral oil anywhere from monthly to quarterly, depending on how much use your kitchen gets. Small burns, cuts, and scratches can be sanded out of butcher block. Remove stains by sponging on a mixture of one teaspoon of lemon juice or hydrogen peroxide per ¼ cup of water. For tough stains, use wood bleach (oxalic acid); follow package directions and rinse thoroughly. Non-butcher block wood countertops are usually finished with marine oil, which boosts stain resistance. Brooks recommends refreshing marine-oiled countertops monthly with Weiman’s Furniture Cream. Naturally nonporous and stain-resistant, soapstone doesn’t need sealing. But cooking oil—or even just skin contact—can tarnish the surface color. Keep the countertop color uniform with sealer or by rubbing with mineral oil. Mineral oil will darken soapstone’s natural gray hue; sealing will not. Soapstone is relatively soft, so it will nick, scratch and chip, lending the surface a natural, organic quality. Scratches can be buffed out with fine sandpaper or left to create a patina. 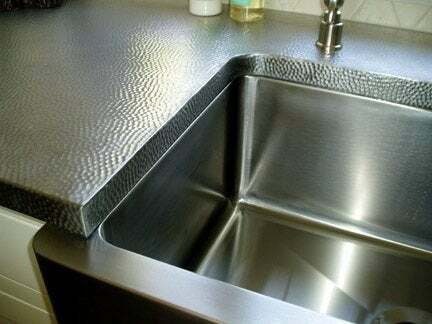 This manufactured countertop material is typically nonporous and doesn’t require sealing. Depending on the brand, quartz is scratch-, stain-, and heat-resistant and stands up well to normal use. Not all brands are created equal; reading your product warranty could contain some tip-offs as to what you can expect. If scratches aren’t covered, that’s a strong hint to be extra mindful about knives and rough-bottomed cookware. To fight stains, mix two tablespoons of hydrogen peroxide, a cup of flour, and enough water to make a paste. Apply to the stain, cover with plastic, and let the mixture dry for up to 24 hours; remove with warm water and a soft cloth. Count on stainless steel to scratch. Minor scratches can be buffed out using an abrasive pad applied in a circular motion. Whether a stainless steel countertop will dent depends on the thickness of the material and how it is installed. 14-gauge metal bonded to a waterproof core is “so solid you could park a Hummer on it,” says Brooks. Even good-quality stainless steel can pick up rust marks from metal scouring pads, cast iron pans, and other rust-prone items. A mild abrasive cleanser or a homemade paste of lemon juice and baking soda will banish rust. Treat stains on laminates with a paste of baking soda and water; let the paste sit for three to five minutes, then gently rinse without scrubbing. For tough stains, try rubbing for a minute or two with a cotton ball dampened with household bleach; rinse and dry. Remove fine scratches or stubborn stains by applying a mild abrasive in small circular motions on the entire surface. These solid surfaces can acquire a plastic-y patina, which can be removed professionally. A stainproof finish should be applied before installation by the fabricator or manufacturer; the surface cannot be retro-finished. A seasonal application of tung oil can boost the stain resistance of sealed concrete; paste wax lends a warm, slightly glossy look. When it comes to maintenance, it’s not the tile but the grout that needs attention. Clean stained grout with a toothbrush and mildew-fighting cleaner or bleach diluted with water; rinse carefully. Sealing grout fends off stains and mildew. Tiles can also be re-caulked with mildew-resistant silicone products. materials are tough and durable, so keeping kitchen work surfaces in good shape relies more on common-sense daily use than on occasional onerous upkeep rituals. • Clean counters regularly with a sponge or soft cloth and a mild, non-abrasive cleaner such as dish soap and warm water; rinse and dry to nix smudges and water spots. • Head off stains at the pass by wiping up spills promptly, especially notorious villains like tea, coffee, soda, red wine, oil, tomatoes, vinegar and lemon. • No counter material appreciates puddles. Standing water can leave a film or mineral deposit; it dulls surfaces, causes grout to mildew, damages laminates’ seams, harms wood and shortens the lifespan of sealers. • Knives and high heat are not any countertop’s best friends. Keep cutting boards and trivets (or hot pads) handy. Protect surfaces from warm appliances like toaster ovens. • If jumbo-size canned goods drop from your overstocked pantry like bombs, or you juggle with cast iron frying pans, expect serious dent, chip, and crack issues. 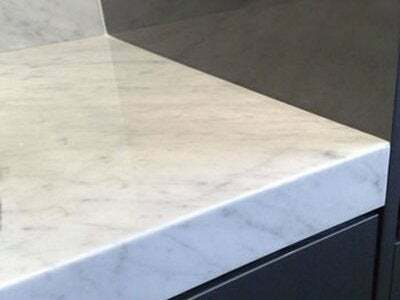 • “You can damage any counter if you really try,” says Richard Brooks, owner and president of Brooks Custom, a Westchester County, New York, countertop manufacturer. Sealing is the least understood granite- and marble-care checkpoint. Sealer makes a counter stain-resistant—not stainproof—by creating a barrier that delays how quickly the surface absorbs a spill. There’s no hard-and-fast resealing schedule, but there is a simple test: Put a few drops of water on your counter and they should bead up. If the water is still on the surface after 10 or 15 minutes, your sealer is in good shape. But if the drops have spread and leave a dark mark on the stone after you blot off the excess, it’s time to reseal. Most hardware stores and home centers carry countertop sealers with detailed application instructions on the packaging. The work typically consists of cleaning and drying the surface, then applying the liquid sealer with a brush or cloth. Let stand for five to 15 minutes, depending on the product, then remove the excess with a dry cloth and buff with a microfiber. Done. To tackle oil stains on marble, try a non-abrasive liquid cleaner with bleach; mineral spirits, acetone, or ammonia are also effective, but do not mix these substances! Clean up food stains with a solution of hydrogen peroxide and a few drops of ammonia. Removing stains from granite and marble may be as simple as a trip to your pantry. For oil stains, blot up any excess oil, then sprinkle the mark with cornstarch and let it sit for 18 to 24 hours. Vacuum up the cornstarch and repeat the process if necessary. For food and drink stains, mix five tablespoons of dish soap with a cup of flour or baking soda. Add enough water to create a paste-like consistency and pread the paste over the stain. Cover it with plastic wrap and let sit overnight. Gently remove the mixture with warm water and a sponge. Do not scrub: Baking soda is a mild abrasive that can scratch shining surfaces. For persistent stains, beef up the paste with some hydrogen peroxide (or a few drops of ammonia) and reapply. Etching is perhaps marble’s biggest problem. It mimics rings left by glassware, but etching is actually a type of corrosion caused by chemical interactions, which eats away the surface shine. To make etching less noticeable, wet the surface, then sprinkle on marble polishing powder and rub it in with a damp cloth or a buffing pad on a low speed drill. For more care tips on wood, soapstone, stainless, laminates and other countertop materials, click here.